On behalf of Dubai Corporation for Ambulance Services (DCAS), we believe the conference informative and worthwhile. The primary goal of this conference was to bring together global EMS leaders and professionals as well as friends and partners from around the world in an open dialogue, under one roof to discuss the issues, challenges in EMS System and to develop possible strategies to make innovative ambulance services to cater the community. We believe that our diverse and dynamic group of speakers and panelists provided in-depth insight, as well as, actionable and practical tools of engagement models, that have worked in other countries; and more effective in the on-going development efforts in ambulance services across the region. I wish you all the best and hope that you continue to be engaged with upcoming DIAC 2018. 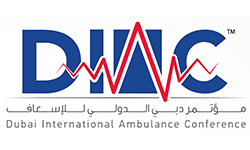 DIAC 2018 will focus on a variety of scientific topics such as Trauma Management, Pre-hospital Care, Neurological Emergencies, Psychological Emergencies, Disaster Activation and eminent case studies on emergency scenarios. While the conference aims to highlight and stress on the theme of ‘Human Resources Management in Emergencies and Catastrophes’; the exhibition invites the response agencies, medical services and support service providers, life support systems and equipment manufacturers, management consultancies etc. to showcase their products, services and upcoming initiatives.